One of my readers, Debbie, recently emailed me and asked me if I had a recipe for Eat'N Park's Seafood Pasta Bake. I told her I did not, but I would try to recreate it for her. Now, I had never heard of Eat'N Park since they are only in Pennsylvania, Ohio, and West Virginia. We don't have that here in Texas. But I aim to please, so please I will. So what is this Seafood Pasta Bake? Well, their website menu says it's "shrimp and crabmeat baked in scampi butter and Alfredo sauce, served on a bed of penne pasta." Wow. Doesn't that sound amazing! So here I jump in with both feet, not having tasted it or even laid eyes on it. I will cook an entirely new menu that I've never made for a house full of company. I'm beast like that. I don't know what beast means, but my kids tell me they are beast all the time so it must be good. So here goes nothin'! Shrimp and crabmeat cooked in scampi butter, homemade Alfredo sauce, all mixed with yummy al dente pasta and a tiny itty bitty bit of cheese on top. Okay, maybe not such a tiny bit. Enjoy! Meanwhile, melt the butter in a large skillet and drizzle in some olive oil. Cook the shallot until tender. Deglaze the pan with the wine and cook a couple of minutes to reduce. Add in the shrimp, crabmeat, parsley, and garlic and cook until the shrimp is pink and done, about 3-4 minutes. Season with a bit of salt and pepper. Squeeze the lemon over the seafood and remove from the heat. For the Alfredo sauce, melt the butter in a saucepot. Add in the cream and garlic and bring to a boil. Remove from the heat and whisk in the Parmesan cheese, a little at a time, until completely melted and the sauce is thickened. Preheat the broiler. Mix the seafood and the sauce with the pasta. Spread this into a casserole pan and sprinkle the Mozzarella all over the top. Broil for a couple of minutes to melt and brown the cheese. It's no secret that Mardi Gras means Fat Tuesday. It's a time of indulgence and feasting. While this isn't the kind of food you should eat every day, one day a year won't kill ya. 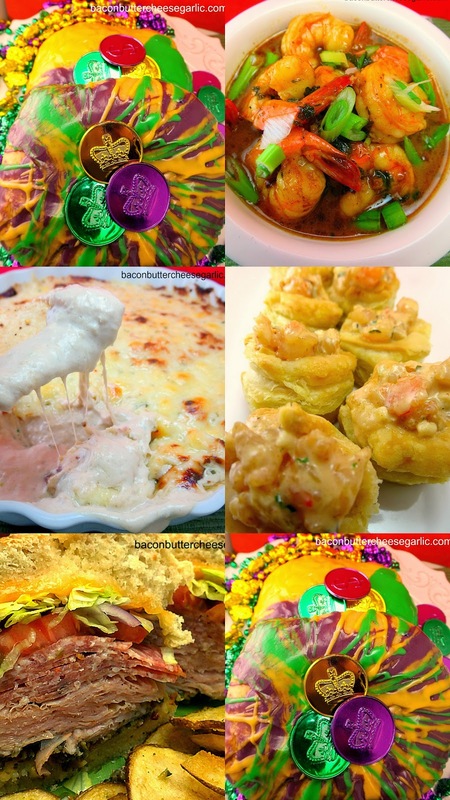 Here's my Mardi Gras collection for your next Mardi Gras party! For the olive salad, you can either process all of the ingredients in a food processor or chop all of the veggies and then stir in the rest of the ingredients. For the Garlic Caesar Dressing, mix all of the ingredients together in a blender. To assemble the sandwiches, split the buns and divide the mozzarella and the parmesan to the bottom half of each sandwich and divide the cheddar cheese among the four top halves. Melt under a broiler. Next, spread some of the olive salad on the bottom buns. 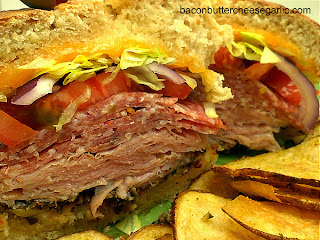 Layer the ham and salamis, tomato slices, red onion slices, and lettuce. Drizzle on some Garlic Caesar Dressing and enjoy! This is a pretty traditional New Orleans BBQ Shrimp recipe. It doesn't contain BBQ sauce, and it's certainly not cooked on the grill. Who knows why they call it that, but you can for sure call it good. The sauce is perfect for dunking a piece of French bread into. This is a darn tasty treat! Melt the butter in a large skillet and add in the olive oil. Put the garlic in and stir quickly, cooking about 30 seconds. Add in the wine, Worcestershire sauce, and Cajun seasoning. Cook a couple of minutes to reduce. Add in the shrimp, parsley, lemon juice, and hot sauce to taste. Cook the shrimp until they are pink and completely done, about 3 to 4 minutes for large shrimp. Remove from heat and sprinkle the green onions over the top. Serve in bowls with the sauce ladled over the top. Serve with the French bread. NOTE: The sauce separates when leftover, so it should all be eaten right after cooking. This dip is creamy, cheesy, a touch spicy, and delish! Serve with your favorite crackers or tortilla chips! Preheat the oven to 350 degrees. Mix all ingredients together, reserving half of the Pepper Jack. Spread the mixture into a pie pan or 8 x 8 pan. Sprinkle the remaining cheese on top. Bake for about 15 minutes until it's all melted together and cheese on top is browned. Serve with chips or crackers. These delightful little mouthfuls are a great treat for a party or get-together! Little puff pastry cups filled with creamy, spicy shrimp filling will please a crowd! Bake the puff pastry cups according to directions. If necessary, poke the centers back down after removing from the oven. Meanwhile, melt the butter in a large skillet and drizzle in some olive oil. Cook the onion and bell pepper until tender. Deglaze the pan with the wine. Add in the shrimp, garlic, hot sauce, Cajun seasoning, red chili flakes, Worcestershire sauce, and green onions. Cook a couple of minutes or until shrimp is done. Add in the cream and bring to a bubble. Remove from the heat and stir in the Parmesan cheese, adding the additional cheese if the sauce isn't thick enough. Spoon into the puff pastry cups. The tradition behind this cake is interesting. There is usually a plastic baby baked inside of the cake. The person that finds the baby is pronounced the king for the year and has to bring the King's Cake the next year! Put the yeast, sugar, and water in the bowl of a mixer. Let it sit about five minutes or until it becomes foamy. Add in the flour, vegetable oil, and salt. Mix with a dough hook until it forms a ball. (Add in the remaining 1/2 C flour if it's too sticky.) Place this into a very large greased bowl and cover with plastic wrap. Let it sit and double in size, about an hour. Meanwhile, beat the filling ingredients together in a mixer or with a whisk. Once the dough has risen, roll it out into a large rectangle and divide into four pieces. Place 1/4 of the filling into the center of each piece of dough. Fold the edges down over the filling and form a ball shape, making sure no filling shows through. Place seam-side down onto a baking sheet. Cover and let it rise again, about 45 minutes. Make the glaze by adding a little milk at a time to the powdered sugar, whisking to combine. When it's thin enough to spread, divide it into three different bowls and color yellow, purple, and green. Cover and set aside until ready to use. Preheat the oven to 350 degrees. Bake the cakes about 20-25 minutes or until they sound hollow and are well browned on top. Let them cool before glazing. This is a pretty traditional New Orleans BBQ Shrimp recipe. It doesn't contain BBQ sauce, and it's certainly not cooked on the grill. Who knows why they call it that, but you can for sure call it good. The sauce is perfect for dunking a piece of French bread into. It is a very quick and easy dish. And it is a darn tasty treat! When I was a kid, I loved going to Chinese buffets. I remember having to go back multiple times and get several plates so that I could try everything. And then I pretty much had to lay down the rest of the day because I was so full. And I usually had a headache too from all of the MSG. We don't go to Chinese buffets anymore, one, because it's rare to find a good one, and, two, it's cheaper and healthier to cook at home. And most of the time we like home-cooked food better than restaurants. Chinese Food Night is a favorite in my house. My husband loves it and so does our picky 13-year-old son. He absolutely loves stir fry. And, while we may call it Chinese, I really just cook all sorts of Asian foods and we just call it Chinese since you'll see a lot of those things typically on a Chinese restaurant buffet. General Tso's Chicken is an American Chinese dish that's found everywhere. It's usually fried chicken pieces coated with a sweet and spicy glaze. I didn't want a thick coating of breading on the chicken, so I just lightly coated the chicken pieces with cornstarch. This turned out great and our son ate all of the leftovers! This probably isn't a traditional version, but it's my version and we all know I like to do everything my way. Hope you enjoy it! Remove the chicken from the marinade and pat dry. Put the marinade into a pot and bring to a boil. Reduce the heat slightly and continue cooking and bubbling until it has reduced and is thick, about 10 minutes. Meanwhile, place some cornstarch into a bowl. Preheat some peanut oil in a large skillet to 350 degrees. Dredge the chicken in the cornstarch and shake off the excess. Fry in batches until the chicken is cooked through and golden brown, about 3-4 minutes each side. Keep them warm in a 200 degree oven until they are all fried. Put the chicken in a bowl. Pour the glaze over and toss to coat. Garnish with green onions. Great served over rice! This casserole is not only super easy, it's pretty darn tasty! Like so tasty we raved about it for days after. It makes a big pan, so it's great for parties or company! Preheat the oven to 350 degrees. Mix the half and half, sour cream, melted butter, garlic powder, Ranch mix and soup mix together with a whisk. Stir in the hashbrowns. Spread this into a greased 9 x 13 casserole pan. Sprinkle the cheese on top. Spread the French-fried onions all over the top. Cover and bake about 45 minutes to one hour or until potatoes are done. During last five minutes of baking, remove the foil to brown the top slightly. One of my all-time favorite movies is Overboard. It's a movie starring Goldie Hawn and Kurt Russell. It's about a not very nice woman who falls off of her yacht and gets amnesia. Kurt Russell, who did some carpentry work for her yacht, finds her and tells her she is his wife. It's a hilarious movie, and I could probably recite the whole thing for you. Anywho, one of my favorite lines in the movie is when, back on the yacht, she pops open a beer and takes a drink and says, "Good Stuff." If you haven't seen it and like older movies, this one is the one to watch. 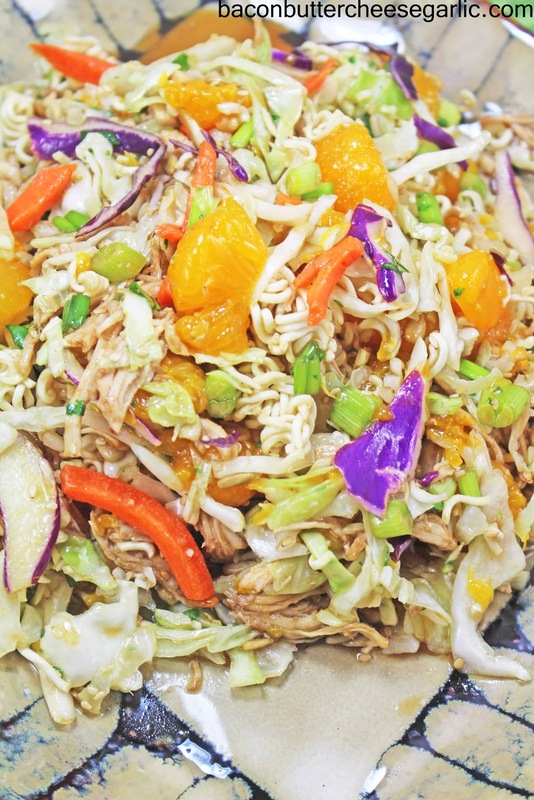 So, when I set out to make this slaw, I wanted to make a version of what some people call Asian Ramen salad. But, to me, it's more like a slaw so I'm going with that. And, when my daughter and I tasted it, it was at that moment that I said, "Good Stuff." Really, I should have said, "Great Stuff." 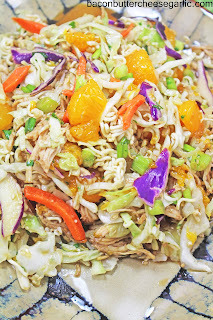 From the chicken to the mandarin oranges to the sweet and savory dressing to the crunchy sunflower seeds, this stuff was awesome! Truly. You'll see. Mix chicken flavor packets from the Ramen with the oil, rice wine vinegar, brown sugar (to taste), cilantro, soy sauce, and a few drops of sesame oil (to taste). Add in the remaining ingredients except the Ramen and mix to coat. Refrigerate at least 30 minutes before serving. If eating right away, the Ramen can be mixed in. If you want the Ramen to remain crunchy for leftovers, leave the Ramen separate and add when eating. My husband loves the salsa at On the Border, so it was imperative that I try to create it. He thinks this is pretty darn close. This recipe makes about 10 pint jars, so you'll need to know the canning process or have air-tight containers and good freezer space. Preheat the oven to 400 degrees. Lay all of the jalapenos and serranos in a single layer on a sheet pan. Roast them until they are soft. When they are cool enough to handle, remove the stems and rough chop all of the peppers. Bring a pot of water to boil and add in four to five tomatoes. When the skins start to crack, take them out of the water. When they are cool enough to handle, peel the skins off of the tomatoes and cut them in half. Repeat with remaining tomatoes until they are all peeled. In a very large bowl, add all of the ingredients. Blend to your desired consistency in batches in a blender (or use an immersion blender in the big bowl). Ladle batches into pint jars and can or ladle batches into freezer containers and freeze. If canning, follow your normal canning procedures. I got a great load of veggies in my last Bountiful Basket, so what better to do than a salad! But, alas, I had no salad dressing fixings. Sure, I could have done an Italian vinaigrette, but how boring is that. What I did find was some leftover homemade barbecue sauce and some leftover Ranch dip. Why not! Barbecue Ranch dressing may sound a little strange, but it was muy fabuloso! This is a totally customizable salad. Add what you want or leave out parts you don't want. I'm not giving measurements here for anything but the onion strings and the dressing. The rest is up to you to make a little or a lot. Enjoy! Mix the dressing ingredients together and refrigerate until ready to use. Soak the sliced onions in buttermilk for about 30 minutes. Mix the flour with some seasoned salt, garlic powder, and black pepper to taste. Preheat some peanut oil in a skillet to medium high heat. Dredge the soaked onions in the flour mixture. Fry for about a minute or so on each side until they are crispy and browned. Put some Romaine lettuce in a bowl. Place your desired salad toppings (corn, eggs, tomatoes, etc) in rows on top of the lettuce and dress with the BBQ Ranch dressing. Love queso and pasta? Why not have them together! This is quick and darn tasty! Cook the pasta according to directions. Drain and return to the pot. Add in the remaining ingredients and cook over medium low heat until the cheese is completely melted. You are either going to love this or hate it. Crispy Roasted Broccoli. We loved it in our house. It takes on a very strong yet delightful flavor. If you are afraid of it being too strong, just don't cook it as long and it will just be roasted broccoli. Preheat the oven to 375 degrees. Spread the broccoli out on a sheet pan. Drizzle with olive oil. Sprinkle a bit of garlic powder, Parisien herbs, and salt and pepper over the broccoli. Toss them around with your hands and spread back into a single layer. Bake for about 15-20 minutes or until the spears are the desired crispness. Our son is an avid Hot Pockets freak. He asks for them every single time someone says they are going to the store. We buy them every once in a blue moon as a treat, but we generally don't eat frozen or prepackaged foods. So why not make him homemade Hot Pockets? His usual favorites are either ham and cheese or pizza. But, being a true Texan and a Tex-Mex fan, I went with a chicken taco filling. You really can fill these with anything you want, even vegetarian. I also dressed them up a little and gave it a slightly crunchy coating with some Ritz crackers. And, of course, it wouldn't be complete without a Monterrey Jack cheese sauce. And you know what? He loved them! Darn tasty! Preheat the oven to 375 degrees. On a floured board, roll the puff pastry sheet out a bit. Cut into four pieces. Mix the chicken, taco seasoning, 1/2 C Monterrey Jack cheese, and cream cheese together in a bowl. Divide this filling into fours and put into the center of each piece of puff pastry. Fold the sides and ends over the filling, making sure to cover all of the filling. Mix the eggs with a couple of tablespoons of water. Dip each pocket into the egg wash and then into the crushed Ritz crackers. Place them seam side down on a baking sheet. Bake 25-30 minutes or until the pastry is fully cooked and browned. Meanwhile, melt the butter into a pot over medium high heat. Whisk in the flour. Quickly whisk in the half and half and the chicken bouillon. Cook until thickened and bubbly. Remove from the heat and whisk in the 1 C Monterrey Jack cheese until completely melted. Add the additional 1/4 C half and half if the sauce is too thick. This is a really interesting vegetable. They are actually pretty delicious and seem to resemble the flavor of pumpkin. 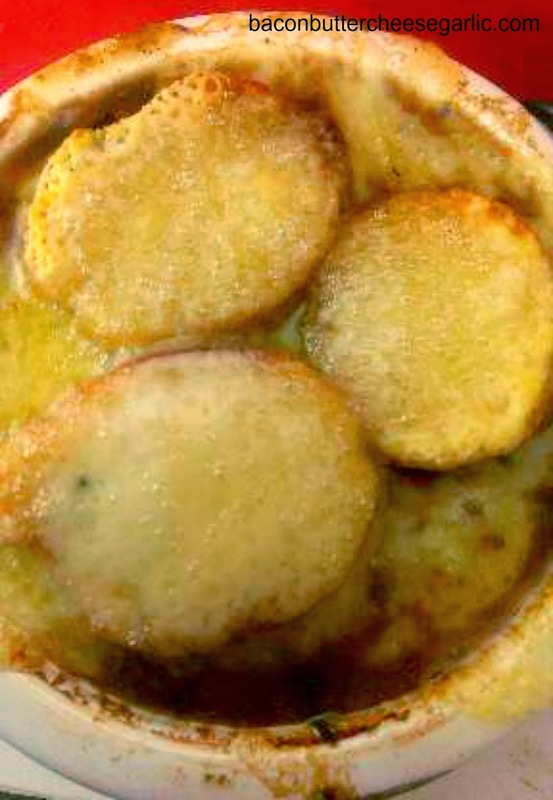 Baked with cream, butter, thyme, garlic and Parmesan cheese, this is a great and easy accompaniment to any dinner. Preheat the oven to 375 degrees. Cut each squash in half and scrape out the seeds and pulp. Put them on a sheet pan and season with salt and pepper. Sprinkle the thyme over each half and spread some garlic into each half. Place a piece of butter into each half and pour a little cream into each half. Bake for about 40 minutes. Halfway into the 40 minutes, dip a brush into the butter and cream mixture and brush that over the cut edges of the squash. Remove the squash from the oven and sprinkle some Parmesan cheese over each squash. Return to the oven and bake for an additional 15 minutes or until the squash is fork tender. My husband and I have a tendency to go a little overboard in the kitchen sometimes. One time we tried to make our own turducken. It was disastrous. Then there was the time we tried to make homemade sausage. We broke a brand new meat grinder in the process. And the sausage smelled like feet. And, if I had to guess what feet tasted like, I'd say that sausage was it. So, when I set out to cook the other night, I tackled a simpler meal. Sweet & Spicy Garlic Chicken. There are a lot of Pinterest pins out there for a Brown Sugar Garlic Chicken, which sounded pretty good. However, the recipe seemed to be a hit or miss. It's cooked at 500 degrees. It's sticky and messy. For some, the garlic burned. So I decided I'd base my recipe off of that, minus the 500 degrees. I also turned the brown sugar garlic mixture into a glaze instead of brown sugar piled onto the chicken and baked. And, of course, I had to make it a little spicy. And it turned out great! Our son is a huge sugar fan, and he loved this chicken. It was easy and tasty. Good for keeping things simple. Preheat the oven to 375 degrees. Mix the brown sugar, butter, and cayenne pepper together. Season both sides of the chicken with some seasoned salt, black pepper, and garlic powder. Line a sheet pan with foil (this is a must). Spread half of the brown sugar mixture on one side of each piece of chicken. Bake for about 16 minutes. Take the chicken out of the oven and turn each piece over. Spread the remaining half of the brown sugar mixture over the chicken. Spread two minced garlic cloves over the top of each piece of chicken. Spoon any glaze from the foil back over the chicken. Return to the oven and bake for an additional 12-14 minutes or until the chicken is done. Spoon the glaze from the foil over the chicken and serve. Queso Flameado means "flamed cheese" which is traditionally a cheese dip with chorizo that is usually served flambe, which means set on fire. I don't do so well with fires, so I just made mine in the oven. And I put my spin on it and surprisingly...there's no bacon! But you could add some cooked chorizo or bacon if you like. Enjoy! Preheat the oven to 400 degrees. Put the poblanos on a sheet pan and roast, turning occasionally, until they are black and charred all over. Remove from the oven. When they are cool enough to handle, peel as much of the skin off as you can. Remove the stem and seeds and chop the peppers. Set aside. Melt the butter in a large ovenproof pan, preferably cast iron. Drizzle in some olive oil and cook the onions and Fresno peppers until tender. Add in the mushrooms and garlic and cook until they are tender. Add in the spinach and cook until it's wilted down. Stir in the cilantro and tomatoes and season with salt and pepper. Remove from the heat and stir in the poblanos and cheeses. Turn on the broiler and put the whole pan under the broiler for about 5 minutes to melt the cheese and brown the top. Serve with tortilla chips. These were so good I made them twice in one week! A shrimp stuffed with a roasted jalapeno slice, wrapped in bacon, and topped with Pepper Jack cheese! I know you're drooling now! If you don't know how to butterfly a shrimp, ask the butcher in your grocery store. They should do it at no charge. Also, if your bacon is thick cut, you will need to partially cook it in the oven on a sheet pan for about 10-12 minutes to where it's starting to cook but still pliable. Preheat the oven to 400 degrees. Put the jalapenos on a sheet pan and roast about 15-20 minutes, turning occasionally, until they are soft. Remove from the oven and cool. When they are cool enough to handle, remove stems and seeds. Cut each jalapeno into three strips. Reduce the oven to 350 degrees. Take a strip of jalapeno and lay it in the butterflied groove of the shrimp. Wrap the shrimp with a piece of bacon and secure with a toothpick. Place them on a sheet pan, sprinkle some black pepper over each one, and cook 6-8 minutes or until the shrimp and bacon are done. Remove them from the oven and turn on the broiler. Sprinkle a little cheese on each shrimp and place the pan back under the broiler for a minute or two to melt the cheese. Rumaki is an old-fashioned appetizer that was created by Victor Bergeron, founder of Trader Vic's Restaurant, which is a Polynesian themed restaurant. It first appeared on a menu around 1941. It is usually a water chestnut and marinated chicken liver that is wrapped in bacon and broiled. I skipped the chicken liver here, but, if you're a fan, go for it. This is quick and easy and darn tasty! Mix the soy sauce, brown sugar, and ginger together. Wrap each water chestnut with a piece of bacon and secure with a toothpick. Put them in about an 8 x 8 casserole pan. Pour the marinade mixture over the tops. Refrigerate for at least an hour. Preheat the oven to 375 degrees. Cook the rumaki for about 15-20 minutes, depending on the cut of the bacon. If it is thick cut, after 20 minutes, turn on the broiler and broil until the tops of the bacon are crisp. Serve hot. Ever see that movie Julie & Julia where Julie Powell buys Julia Child's book, "Mastering the Art of French Cooking?" If you haven't, this is a true story where a woman buys the book and cooks her way through it, all the while blogging her journey. You know what? I have that book too! But there's no way in the world I'm cooking my way through it. I just wanted to make a few of her recipes, mostly soup. I have been craving French Onion Soup for a while now, especially since it's been cold here in good ol' West Texas. So I cracked open Julia's French bible, and there it was. The French Onion Soup. Why would a soup made from onions be so special? Why would anyone want a mostly brothy soup? Well, my friends, I'll tell you why. As you gently coax rich flavor from some seemingly boring onions, you embark on a flavorful journey that far exceeds your soup expectations. Then you finish it with a rich beefy broth and top it with a cheesy crouton. Pure bliss. The seemingly humble onion becomes king for a day in this soup. You'll see. I mostly stuck with her recipe, except I didn't finish it with cognac and I added mushrooms. Hope she's not turning over in her grave. I just can't help myself. I'm very mischevious. In a large dutch oven or stockpot, cook the onions in the butter and oil over medium low heat covered for 15 minutes. Uncover and raise the heat to medium. Stir in the salt and sugar. Cook for 30-40 minutes, stiring frequently, until the onions are very golden brown. Meanwhile, cook the mushrooms in another skillet in olive oil until tender. When the onions are fully caramelized, sprinkle the flour over the onions and stir. Add in the wine and deglaze the pan. Add in the beef stock, mushrooms, and garlic and bring to a boil. Reduce to a simmer and cook until thickened, about 20 minutes. Meanwhile, dry out the baguette slices in a 250 degree oven for about 10-15 minutes. Once they are crispy, remove them from the oven and turn on the broiler. Ladle the soup into bowls. Place a baguette or two on top of the soup. Place some cheese slices over the soup and the baguettes and place under the broiler to melt.